Discover the Trace at North Major, the most charming apartments in Beaumont, Texas. 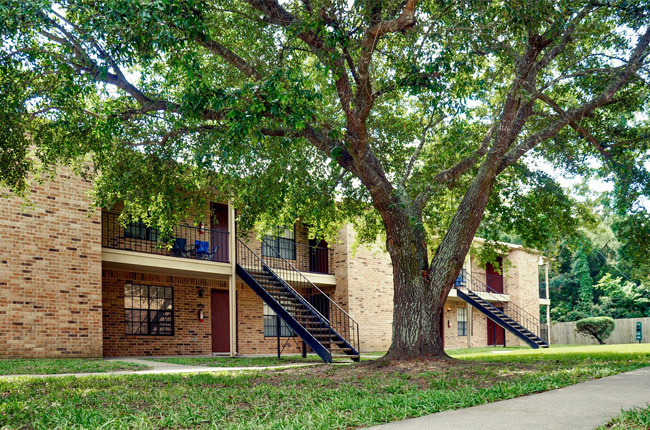 We offer all of the pleasantries associated with quaint, quiet apartment living with the added convenience of a one-of-a-kind location that allows you enjoy all that Beaumont has to offer. The comfort of your new apartment, complete with a suite of modern amenities and the most up-to-date appliances, is waiting for you among the mature oak trees that adorn our green, landscaped grounds. Step inside and bask in the ease of contemporary living with your full-size washer and dryer, self-cleaning oven, and frost-free refrigerator, all of which are featured in every one of our apartment homes. If you are looking for the ultimate satisfaction that comes with modern community living, rest assured that you have found it at the Trace at North Major in Beaumont, Texas. Schedule your personalized tour today! Experience the all-around joy of living in a beautiful, open area with the excitement of Beaumont just minutes away. Our premier apartment community is right down the road from Parkdale Mall where you can find the latest trends at Dillard's, Hollister, and Forever 21. There are also many surrounding hotspots to make every night out one to remember with trendy music venues, lively bowling alleys, and even a Hollywood Theatre, featuring all the latest blockbusters. Grab a bite to eat at one of the many restaurant options nearby! Choose any type of cuisine from Mexican fare to American steakhouses. And the fun doesn’t stop there because Downtown Beaumont is a quick fifteen minute car ride away, providing residents with infinite possibilities in a prime location.